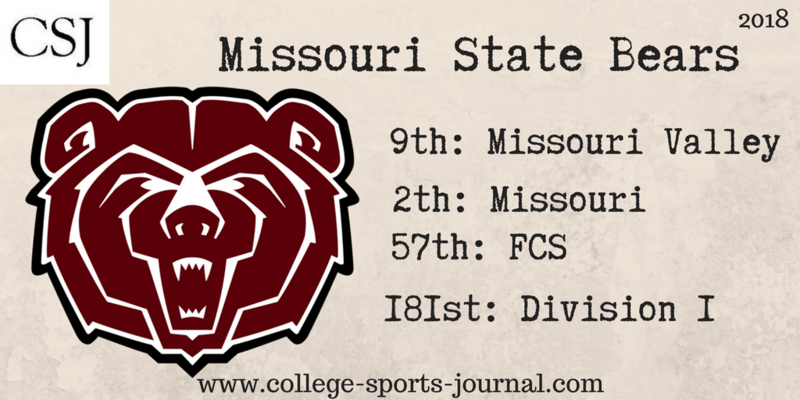 2017 In A Sentence: In Coach Steckel’s three years, the Bears have shown progress each year and wound up 3-8 overall last year with two of the wins in MVFC play (over Indiana State & Southern Illinois). Biggest Shoes to Fill: KR/WR Deion Holliman was honored as a first-team All-MVFC choice for the third-straight year in his final season in Springfield. He finished his MSU career as the MVFC’s all-time leader in kickoff return yardage (2,445) after totaling 493 yards on 22 returns last year. He was also the Bears second-leading receiver in MVFC play with 3.0 grabs per outing. Key Player: QB Peyton Huslig drew all 11 starting assignments for the Bears in his freshman season with the program, passing for 1,981 yards and nine touchdowns, while amassing 2,602 yards of total offense to rank fifth in the MVFC. He logged MSU all-time top 10 season figures for total offense and passing yards. He was named MVFC Newcomer of the Week on two occasions and turned in three 100-yard rushing games to finish as the Bears’ leading ground-gainer for the year. Fearless Prediction: The biggest key for the Bears to continue to improve this season will be their defensive play (gave up over 38 points per game in 2017). The Bear defense, however, does bring back 10 starters so should be experienced. The Bears likely will improve as a team but getting past three wins might be all that can be expected this year.